The absence of a name or logo in this list does not constitute a waiver of any and all intellectual property rights that TEKEASE® Franchise Systems has established in any of its product, feature, or service names or logos. The status column refers to the status of the trademark in the United States and/or other countries. TEKEASE Primary Care	 ™ Character Mark. Installation, repair and maintenance of computers and computer peripherals. Back-up services for computer hard drive data; Computer monitoring service which tracks application software performance, performs periodic maintenance and provides reports and alerts concerning such performance; Computer monitoring service which tracks hardware performance and processes and sends out historical reports and alerts; Computer services in the nature of customized web pages featuring user-defined information, personal profiles and information; Computer technology support services, namely, help desk services. We Make Technology Easy	 ™ Character Mark. Installation, repair and maintenance of computers and computer peripherals. Life-Support for Your Technology ™ Character Mark. Installation, repair and maintenance of computers and computer peripherals. TEKEASE PC Check-Up	 ™ Character Mark. Installation, repair and maintenance of computers and computer peripherals. Computer Trauma Unit ™ Character Mark. Installation, repair and maintenance of computers and computer peripherals. 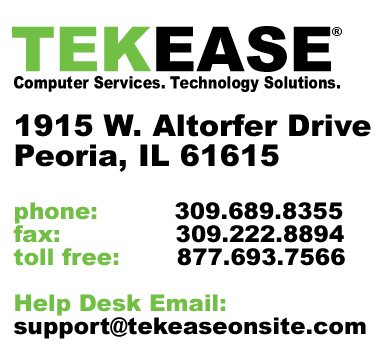 TEKEASE ON-SITE® Logo	 ® Logo and Design. Installation, repair and maintenance of computers and computer peripherals. Franchise services. TEKEASE® ® Character Mark. Installation, repair and maintenance of computers and computer peripherals. Franchise services.